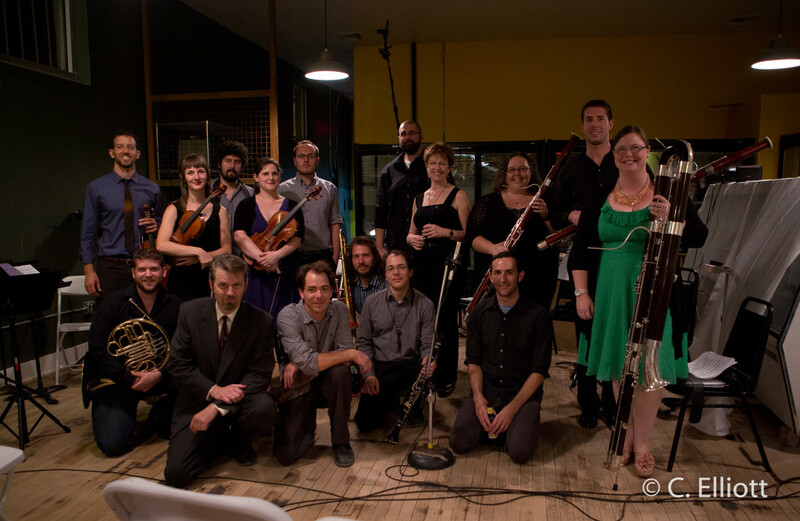 ChamberLab seeks new composers for our ongoing efforts! 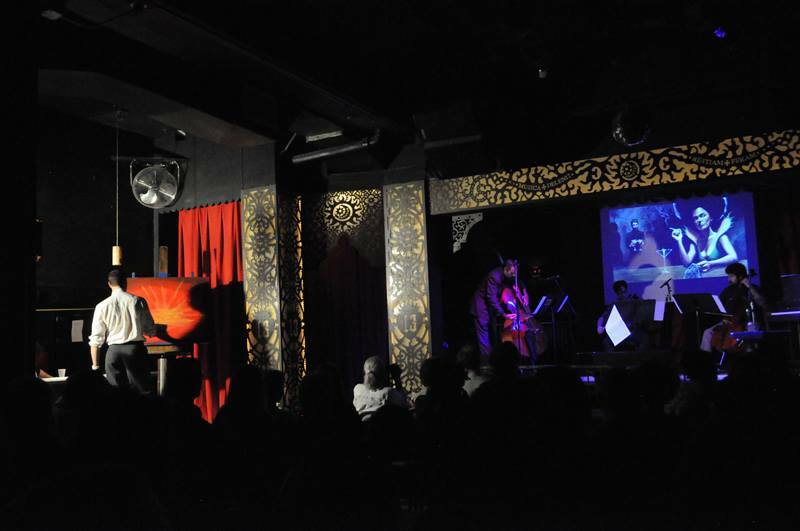 As you may know, we are an alt-classical, DIY chamber music series presenting new concert music in non-traditional venues, and most often from outsider composers as well. And we want more! 1) A strong narrative sense. The more the audience feels like they’ve been told a story, or that something has happened, the better we like it. 2) A strong visual sense. A piece that transports the listener to a nearly-palpable “other place” is a good fit. 3) A prominent display of virtuosity. We have tremendously gifted performers involved in our concerts, and I don’t think we’ve even scratched the surface of their capabilities yet. I’d like to fix that. Interested? Please email Chris Black, and send along a link to audio/video of your work, or even a Sibelius file. Our next concert will likely occur in the fall of 2016, with a deadline for composition in August or September, but the sooner we hear from you, the better! ChamberLab presents an encore performance of Buster Keaton’s classic Civil War comedy The General, with an all-original soundtrack performed live by an eleven-piece chamber orchestra in the pit of the historic Fox Theatre, and this time we’re recording the concert for a DVD release! You can be a part of it! Reserve your tickets through our our Indiegogo campaign and you may also pre-order the DVD! 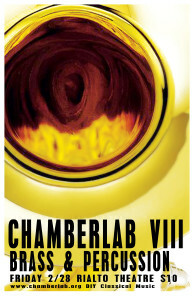 ON FRIDAY, FEBRUARY 28th, at 8pm: ChamberLab, Tucson’s D.I.Y. 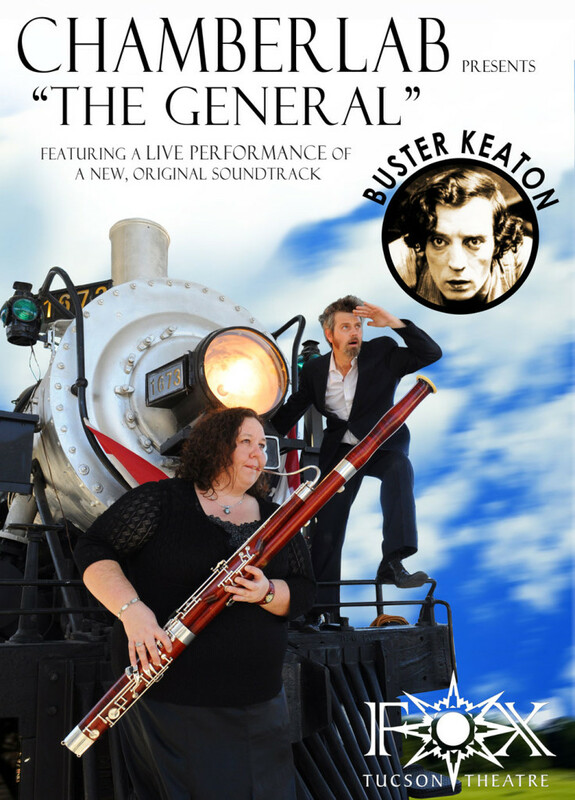 classical concert series, roars and thunders at the Rialto Theatre with a concert for brass ensemble and orchestral percussion, and we don’t need a sound system for this one. The orchestra will arrange themselves on the floor in front of the stage, with seating in the round, and the large, wonderfully reverberant, delightfully concrete historic theater will ring and boom with the glorious sound of trumpets, trombones, tubas, sousaphones, orchestral bass drum, timpani, tom toms, marimba, vibraphone, gongs, and circular saw blades. Building upon the success of ChamberLab’s September string/piano trio concert featuring live painting by artist Joe Pagac, and the one-year anniversary concert release of their first full-length album One Strange Day (http://chrisblackmusic.bandcamp.com/album/one-strange-day), ChamberLab founder and artistic director Chris Black turns the ensemble up to eleven in this latest offering. Veteran ChamberLab composers Chris Black, Benjamin DeGain, Dante Rosano, Marco Rosano, Tony Rosano, are joined by newcomers Jimmy Carr (accordionist and singer of the Awkward Moments), Jeff “Mr. Tidypaws” Grubic (tenor saxophonist and composer with Jazz Telephone), and Mohadev Bhattacharya (co-composing with Benjamin Degain). Performers include Byron Yount (trumpet, freelance), Jason Carder (trumpet, Yanni), Joseph Muñoz (trombone, Tucson Symphony Orchestra), Steven Gamble (bass trombone, Tucson Symphony Orchestra), David Legendre (tuba, Greasy Light Orkestra), Paul Gibson (percussion, Arizona Symphonic Winds), Seth Vietti (percussion, Boreas), and ChamberLab composer and performer Benjamin DeGain (percussion). Tickets are $10 at the door on the day of the show, but interested parties are encouraged to follow ChamberLab on Facebook (www.facebook.com/ChamberLab) or sign up for the email list at www.ChamberLab.org for special ticket giveaways. BYRON YOUNT (trumpet) has performed with the Queens (New York City) Symphony Orchestra, Harrisburg Symphony Orchestra, Erie Philharmonic, New Bedford Symphony Orchestra, Garden State Philharmonic, Plainfield (New Jersey) Symphony Orchestra, Tucson Symphony Orchestra (frequently as Principal), Co-Principal with the Sonora Philharmonic of Mexico, Principal with the Conductors’ Institute at Bard, and has been Principal Trumpet of the New Jersey Pops Orchestra, Tucson Pops Orchestra, and the Sierra Vista (Arizona) Symphony Orchestra. JOSEPH MUÑOZ (trombone) is from the city of San Diego, California. He received his Bachelor’s in Performance with Teacher Certification from the University of Michigan, Ann Arbor where he performed with the Symphony Band under Michael Haithcock, the University Philharmonic under Andrew George, and the Jazz Ensemble under Ellen Rowe. He studied classical performance practice with David Jackson and jazz improvisation and big band arranging with Dennis Wilson. Joey is currently enjoying his professional career as a symphonic musician, a freelance musician, a private teacher and a substitute teacher for the Tucson Unified School District. STEVEN GAMBLE (trombone and bass trombone) began playing the trombone as a grade-schooler in Phoenix, Arizona. After attending Arizona State University, he moved to Chicago where he was a founding member of the Chicago Chamber Brass. He has held positions in the Santa Fe Symphony Orchestra and the Arizona Opera Orchestra as bass trombonist and is currently Bass Trombonist of the Tucson Symphony Orchestra and the Tucson Pops Orchestra. Mr. Gamble can be heard on recordings for the Pro-Arte and Crystal labels. DAVID LEGENDRE (tuba) David LeGendre (tuba) abandoned the piano for the tuba at the age of 10 in the misguided pursuit of meeting women. He was a member of the Northern Arizona University tuba studio for three years and served as a substitute for the Flagstaff Symphony Orchestra before turning to a career in Software Engineering. After a short hiatus, he returned to music in Tucson, playing with Calle Debauche, The Arizona Symphonic Winds, Greasy Light Orkestra and Chamber Lab. PAUL GIBSON (percussion) is a freelance drummer/percussionist in the greater Tucson area, currently associated with Redlands, the Arizona Symphonic Winds, and the Seven Pipers Society Pipe Band, the Tucson Symphony Orchestra, Tucson Symphony Percussion Quartet, Tucson Pops Orchestra, and the Artifact Dance Project. SETH VIETTI (percussion). Originally classically trained on piano and percussion, he plays and sings in Sun Bones, an Indie band featuring luminescent vocal harmonies and a willingness to plunge into a wide range of musical styles. Their sound is informed by influences including Franz Schubert, the Beach Boys, Animal Collective, Steve Reich, Radiohead, and the Talking Heads. He is additionally a student of Physiology and English at the University of Arizona. BENJAMIN DEGAIN (percussion) is a research specialist working on insect evolution of resistance to transgenic insecticides, as well as spatial effects on insect transmission of plant virus. He became a musician relatively late in life when he bought a pawn shop drum set at the age of twenty-one. Since then he’s performed with jazz bands, rock bands, orchestras, musical theater, and as a composer and performer in ChamberLab. ChamberLab featuring Joe Pagac was a brilliant night! Photo by Shelly Flores. 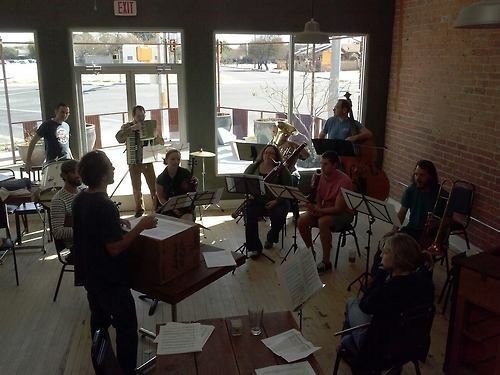 Dante Rosano rehearses his piece with the full crew for the upcoming ChamberLab concert. 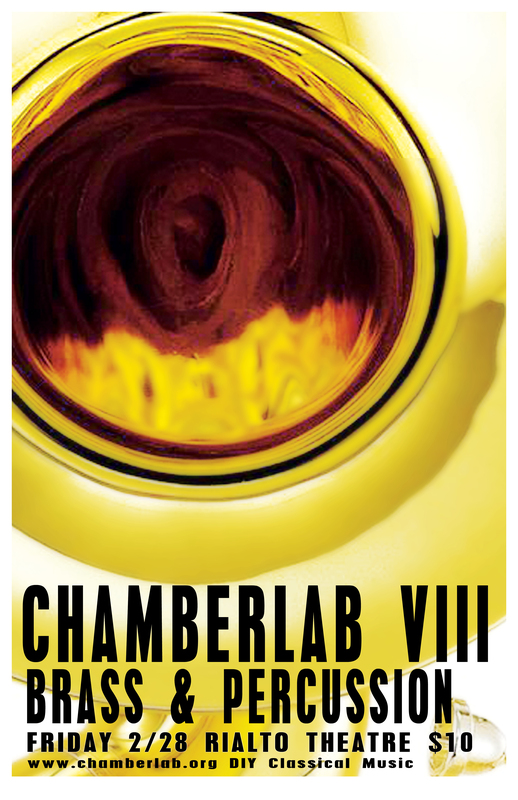 Sign up to receive news about ChamberLab right here. Are you a classical performer in Tucson? We’d love to meet you! If you’re interested, please email Chris Black.